You may have heard that The X-Files is coming back in January. If you were a fan when the show was originally on in the ‘90s—or caught it later in syndication or streaming—this is potentially great news. If you missed the whole phenomenon, we’re here for you. Once again, we venture into the io9 Guide series. The goal is to give a comprehensive, but introductory, look at the most important works in science fiction and fantasy. While it’s intended for newcomers, longtime fans are encouraged to debate us in the comments. Spoilers abound, obviously. On the one side, you’ve got Mulder, who retrieved repressed memories that his sister was abducted when they were both children. That made him a believer, led him to the X-Files, and nuked his career in the FBI. In the pilot, higher ups assign Scully—a forensic pathologist—to keep an eye on him. With her scientific and medical background, she plays the skeptic role on the show. Which is a pretty good summation of the characters. The show’s formula was based pretty hard around Mulder being convinced that something spooky was at fault for whatever crime they were investigating and Scully putting the brakes on by bringing up rational explanations. But the meme is even more about the personalities at play. Mulder was always forging ahead, impulsively and recklessly throwing himself into the path of danger. Scully was the one advocating caution and, god forbid, going by the rules. Also, she ended up running after him and saving the day a fair amount, too. The show was so, so lucky in its main cast. David Duchovny gave Mulder charm and humor, which made his outlandish beliefs seem less crazy. Gillian Anderson had the insanely difficult task of being the skeptic in a universe where ghosts and aliens were definitely real. Scully was smart and resolute—but her beliefs also evolved over the course of the show... as long as there was evidence. Anderson and Duchovny weren’t only perfect for their roles individually, their on-screen chemistry was off-the-charts spectacular, which is one of the reasons The X-Files took off as much as it did. The plots could have been immaculate, but no show connects unless its main characters do. Series creator Chris Carter was less concerned with his characters than he was the stories. In addition to the investigation into the paranormal, the show was also about the cover-up of certain events. Carter credits Watergate with giving him an inherent distrust of government. He combined that with fictional inspirations from Alfred Hitchcock Presents to Outer Limits. Kolchak: The Night Stalker was particularly influential. And it’s thanks to Silence of the Lambs that the show actually takes place at the FBI. In The X-Files world, Carter took his distrust of government and matured it into paranoia. Of course, Fox Mulder’s paranoia was the result of people actually being out to get him. In this sense, the two X-Files movies are representative of the sweep of the show: 1998’s The X-Files (Also known as Fight the Future) was about the mythos. 2008’s I Want to Believe was about a case that had nothing to do with the conspiracy. So how much of the over-arching mythos, or “mytharc,” do you need to understand the show? Well, basically, none. By the end of the series, it had become hopelessly convoluted—mainly because it had been pretty well wrapped up in season six. But three more seasons extended the mythology of the show into strange and confusing areas. Not to say that the mytharc was bad; there are a lot of great episodes that only work because they’re building on what’s gone before. “Duane Barry/Ascension” is a standout in that regard. But the details of the aliens, the government conspiracy, and the plan of the alien “colonists” are not what any newcomer needs to know to understand the X-Files. In the context of the show, you do need to know that Scully was abducted in season two (possibly the best way a show has ever dealt with the pregnancy of an actor), returned comatose, finds a computer chip implanted in her, removes it, gets terminal cancer, and then is healed by Mulder getting another chip to put back in her. Mulder, for his part, eventually does figure out what happened to his sister—abducted, returned to live under the scrutiny of the conspiracy, ran away, and then disappeared into the afterlife—and is himself abducted at the end of season seven... which is about when Scully finds out she’s pregnant with his child. Mulder comes back. The baby, William, has some full-on superpowers. A bunch of people after him. So his parents give him up for adoption to keep him safe and Mulder goes on the run, joined by Scully at the end of the series. I Want to Believe contrives a way to drop the charges against him. That basic knowledge will be all you really need to just watch the 2016 revival, but—as in all things—you should really see how the show executes all of it. There are a lot of ups and downs in the series’ 202 episodes, getting much more uneven as the show hits season seven. But when the show is good, it’s great. More than worth the time to binge watch. In addition to Scully and Mulder, the show populated its world with a number of recurring characters. FBI Assistant Director Walter Skinner (Mitch Pileggi) played exasperated boss to Scully and Mulder. Poor Skinner had to deal with pressure from above (his bosses questioning the utility of the X-Files and the conspiracy interfering) and from below (Mulder flying off the handle.) Despite all that, he’s a reliable ally. There are also the Lone Gunmen: Byers (Bruce Harwood), Frohike (Tom Braidwood., and Langly (Dean Haglund). They’re a trio of conspiracy theorists and hackers who act as Mulder’s expert advisors in a number of situations. They had their own spinoff, which was canceled, and then they returned to the X-Files and died. Or possibly not, since they’ll be in the revival series. For almost the entirety of the series, the face of the conspiracy was the unnamed “Cigarette Smoking Man” played by William B. Davis. His presence was mysterious, then malevolent, and then an obstacle to be dealt with. He tells his own backstory—definitely laden with embellishments and then outright lies—in season four’s “Musings of a Cigarette Smoking Man.” That’s another episode that displays all the strengths of the show. It’s sort of mythology-related, since it covers the villain, but it’s also sort of a standalone, in that it’s mostly a character study. It’s a fine episode to watch without knowing the show. It’s a great episode for people who’ve seen him lurking at the edges of the early series. Over the course of the series, the X-Files division closes, opens, re-closes, and reopens a number of times. There are a couple of FBI agents that cycle through when that happens. They range from being conspiracy plants to just agents sent to partner Scully and Mulder. After Mulder was abducted in season seven, Scully gained Agent John Doggett (Robert Patrick), who played skeptic to her believer. Doggett then got his own new partner in Monica Reyes (Annabeth Gish). Ho-boy, what didn’t the show impact? 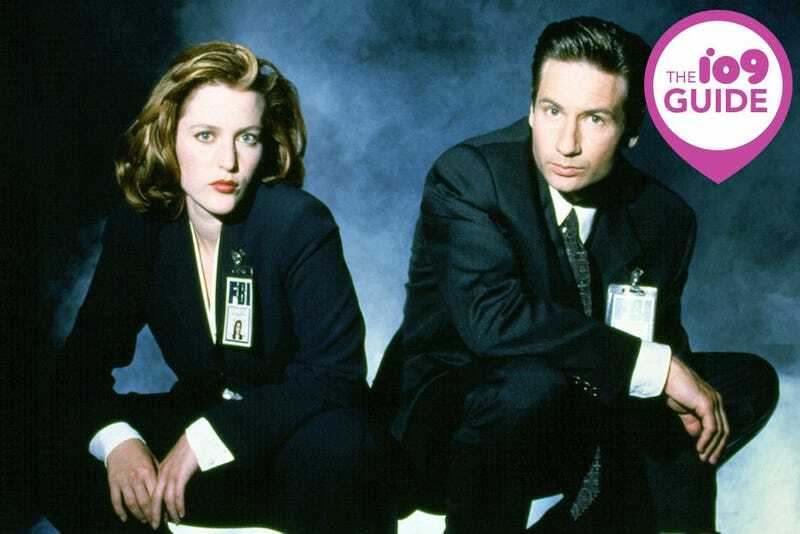 The X-Files was a cultural juggernaut in the ‘90s. You didn’t have to actively watch the show to know what it was about, and a tall male FBI agent paired with a red-haired female one was instantly recognizable as being a take-off of this show. Whenever there’s a skeptic and believer pair now, it’s been influenced in some way by The X-Files. The X-Files also hit at exactly the right time to be an influential online fandom. “Shipper” and “shipping” are now common pop culture terms, but they started in X-Files fandom. Being an X-Files fan meant being fluent in a whole new language: MSR (Mulder Scully Romance), NoRomos (No Romance—anti-shippers), X-Philes (fans), UST (Unresolved Sexual Tension). TV Tropes has eight tropes named after the show. Shows with longstanding mysteries are favorably compared to the show. And if they don’t stick the landing? They are still compared to this show. Russell T. Davies and Joss Whedon both described one of their shows by using The X-Files as a point of comparison. And let’s not forget that Vince Gilligan, a longtime X-Files producer and writer, hired Bryan Cranston for Breaking Bad after seeing his work on that show. Birthed from the shattered trust in the government created by Watergate, premiering when conspiracy theories and UFOs were on a cultural high, ending when questioning the government was no longer in vogue, and returning when people know the government can watch everything they do, the X-Files is a show that taps into the public sentiment in a unique way. Beyond that, it was a hothouse that allowed some extremely unique stories and voices to flourish. Few shows have as many great episodes across so many different categories. So go watch it all. And trust no one.